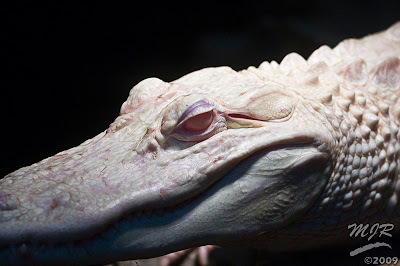 Albino alligators are rare in the wild. In fact, they've only been spotted in Louisiana, and an adult one has never been seen in the wild (the lack of pigment makes them easy prey for both predators and the sun). But there are about 50 albino alligators in captivity. Here's one them. Mike Raiford took this photo at a zoo. Notice the albinism. Notice the evil in the eye. 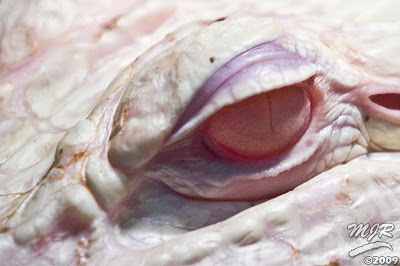 No, Mr. Alligator, the pink iris does nothing to mitigate the malice lurking in those depths. Thanks for the photos, Mike. I'm curious if they're sensitive to the sunlight? He's gorgeous!!! Don't listen to Wombat, Mr. Alligator! Pink eyes means you're sweet! i didn't know they've only been spotted in Louisiana- for awhile there i loved alligators(so yay!) , including albinos. and yes they are sensitive to the sun because they have no dark pigment melanin, color, in their skin. it protects the skin from the sun. If they send him to school, he's sure to give all the other alligators pink-eye. That mouth looks like such a sinister smile, and paired with the look in the eyes, the expression is so cunning and menacing. LOVE IT!